Manchester City have been drawn against League One side Burton Albion in the Carabao Cup semi-finals with Pep Guardiola’s men just three wins away from retaining the trophy. City needed a penalty shootout for the second year running to beat Leicester in the quarter-finals and were successful, booking their place in tonight’s draw. With the quarter-final round completed on Wednesday night, the draw was made with City getting the kindest draw against Nigel Clough’s Burton, who are currently 15th in the third tier of English football. The other semi-final is an all-London affair between Tottenham and Chelsea. The Carabao Cup semi-finals will be played over two legs. 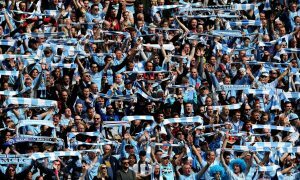 The first leg will be played at the Etihad Stadium on January 8/9 and the second leg at the Pirelli Stadium on January 22/23.